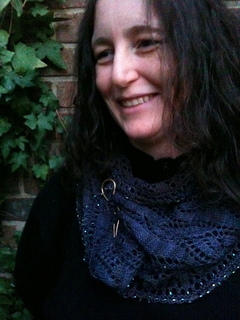 Fiddleheads and flowers climb this drapey, lace cowl with optional beaded edging, which can be worn around the neck or framing the face, with or without a shawl pin to set it off. Beaded cast on and bind off are explained in the pattern. This project requires hard blocking to bring out the lace and reach the right dimensions. This pattern is part of the 2011 Malabrigo Freelance Pattern Project.